The Metabo SB18 LTX Impuls Cordless Impact Drill has Ultra-M technology for highest performance, gentle charging, optimum energy utilisation and long service life. The selectable impuls mode allows for removal of damaged screws and spot-drilling on smooth surfaces. 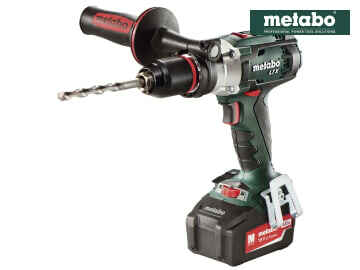 It is extremely powerful thanks to the powerful Metabo 4-pole motor for quick drilling and screwdriving. There is also a high-performance impact mechanism for the best results. Spindle with hexagonal recess for screwdriver bits allow working without the chuck. Robust die cast aluminium gear housing for optimum heat dissipation and durability. Other features include an integrated working light to illuminate the work site, handy belt hook and bit case that can be fixed either on the right or left side and a 43mm collar for versatile use. Supplied with 2 x 18 Volt 4.0Ah Li-Ion Batteries, 1 x Side Handle, 1 x Belt Hook With Bit Case, 1 x ASC 30-36 V Air Cooled Charger and 1 x Plastic Carry Case. 2 x 18 Volt 4.0Ah Li-Ion Batteries. 1 x Belt Hook With Bit Case. 1 x ASC 30-36 V Air Cooled Charger. 1 x Plastic Carry Case.